Born in 1880 in St Petersburg, Alexander Blok was an influential lyric poet and one of the leading lights of the Russian Symbolist Movement. His father taught law at Warsaw University and from very early on the young Blok was surrounded by literary types and an intellectual family environment that influenced him greatly. When his parents divorced, he went to live with family relations close to Moscow where he became interested in poetry and philosophy, particularly the work of Vladimir Solovyov. He married a chemist’s daughter in 1903 for whom he wrote one of his early publications Verses About the Beautiful Lady. From the star of his writing career, Blok had something of an apocalyptic view on life, in part influenced by the work of Solovyov. His premonition that something life changing was coming was confirmed when the October Revolution took place in 1917. He was initially drawn into the conflict and played an active role in interrogations of ministers who had been close to Rasputin. Whilst Blok’s early work can be considered highly lyrical, as he progressed through his writing career he began to introduce more difficult and daring patterns and beats into his poetry. His collection The City, which was published in 1904 introduced impressionistic and often ghostly imagery that helped to push him forward as one of the leading symbolists of the time. With his fame rising, Blok was often compared favorably with the literary notables of the time including Pushkin, publishing other works such as the Mask of Snow and Faina. Prior to the revolution he was also a strong influence on burgeoning writers and poets including Pasternak and Nabokov. One of his most controversial works was the long poem The Twelve which was published the year after the October Revolution, in 1918. The work is a response to the rise of the Bolshevik government and did much to turn many of Blok’s supporters and admirers against him. It cost him many friendships as he was seen to be bowing to the harsh and criminal acts of the unelected regime. Despite this, Blok considered The Twelve to be amongst his best poems and it is noted for using colorful language to put across its story. His later poetry was filled with comparisons between the ideal of beauty that he had discovered in the writings of Plato and the grubby reality of the industrialized world in which he now found himself. Just a few years after The Twelve, Blok had changed his mind about the Russian revolution and he found writing poetry impossible, spending his last years in a hiatus where his output was non-existent. Blok became ill because he could no longer write and there was serious concern over his health, so much so that representations were made to have him treated abroad, though these were initially refused. His friend, Maxsim Gorky, finally wrote to the Soviet People’s Commissar asking for a visa to be granted and this was agreed. By then, though, it was too late. 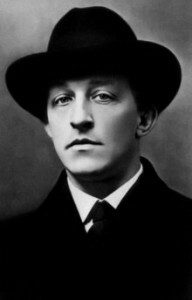 Blok died in August 1921 at the age of just 41.